Neither rain, nor sleet nor bad hangover can keep this intrepid reporter from her fashion rounds in an effort to bring you the best stuff at affordable prices. I started my quest at the Walmart Holiday press event. For most bang for the buck it’s hard to top this retailer’s many brands. I will personally make the schlep to Secaucus, NJ via bus from Port Authority’s terminal. 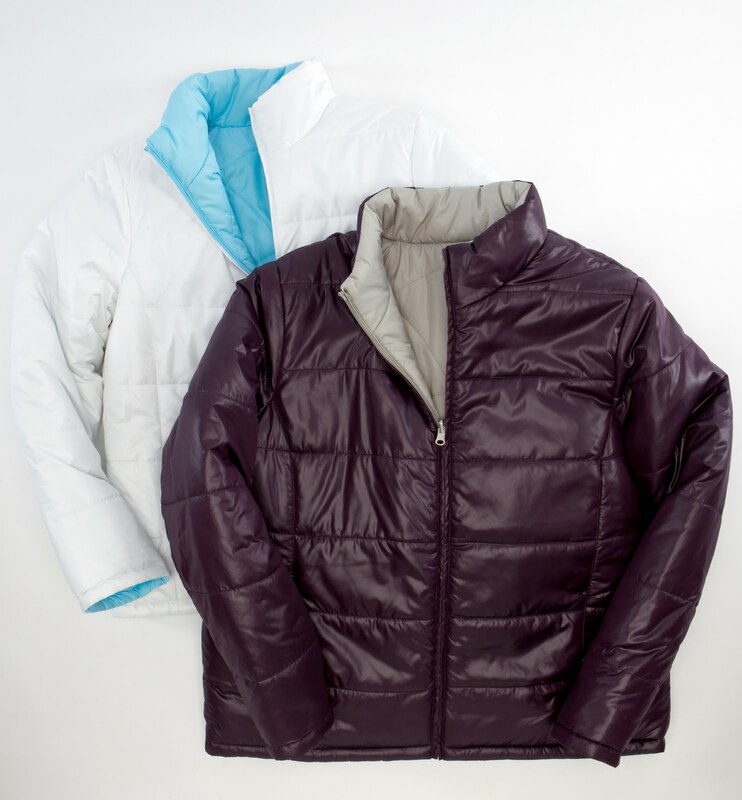 Here’s what I MUST HAVE: Faded Glory’s – get this – reversible puffy jacket that comes in lots of fab colors and retails for only $15.00, or the price of two Starbucks lattes. It's Winter, Bubble-Up at WalMart! Another steal is Walmart’s private label zip top mini shoulder bag in genuine suede. For $14. I plan on getting it in the purple, as well as burgundy. For those dreary winter zero temp days I’ll opt for their version of the Ugg boot in black. At $12. I might even spring for the brown pair also. All Holiday merchandise should arrive in store by mid-November so don’t hesitate as at these prices the merch will fly out. Speaking of footwear, I must let you in on a terrific secret – Payless offers some of the best looking “designer” shoes and bags specifically for this retailer. While I recently saw the gorgeous spring collections, I’m here to tell you about Christian Siriano’s Holiday offerings. They’re in store now but at these prices the shoes will blow out. I already bought his cute black/white/red print flats with gold zipper detail on the vamp. What also sold me was the gold metal trimmed heel. I know what you’re thinking – the shoes sound gaudy but let me assure you they are adorable and will go with everything in you closet right through spring/summer. The price? A whopping $29.95. There’s also a matching bag, but I prefer Siriano’s black patent shopper with detachable shoulder strap and simple chain detail on the front. With zips and pockets galore inside the pink lining, this is a versatile piece and a real deal. Want more bang for your buck? Then why not check out the new consignment shop, Second Time Around at 1040 Lexington Avenue (www.secondtimearound.net). I took a look recently at the affordably priced items (all less than two years old), that are priced 1/3 to ¼ of the original retail. My friend picked up a chic, barely worn pair of Stuart Weitzman suede pumps for under $60 while I took note of the affordably priced range of sweaters and trousers. The merchandise changes frequently so it’s a good idea to look in often. The merchandise ranges from high end designer labels to better name brands. Little Rooms (www.littlerooms.com) , is a California-based jewelry line with a unique look. From the Thornwall Collection, I fell for the clever “Cityscape” bangle available in either gold or nickel plated finish. What this is, teeny little three dimensional skyscrapers that surround the bangle and form the design. No retail prices yet but my guess is that these will retail around $75. Also cute is the “Small Radio” pendant that I found charming in the antiqued gold plated finish but nickel and sterling are also available. The design references those old ‘30s dome shaped radios and looks to be a steal since the wholesale price is only $14. Radio Stud earrings are also available with silver based posts. Jlee Silver is a Chicago-based designer RTW collection at bridge prices. While not cheap, the quality and styling compares very favorably with other top young designer names like Alexander Wang and Jason Woo but at lower prices. I found the collection to be wearable by almost every age since the styling is classic yet with a focus on fabulous materials and unique prints. Some of the highlights from the spring collection include a strapless sheath (with side seam pockets) in silver linen, that will retail for $178. the rust leopard (or solid lilac) shift at $170. and every single one of the gorgeous tunics. These range anywhere from $125. -$148.00. For more info on customer service go to Lindsay Waldron at Lindsay-@-fashionheist.com. While I don’t usually go gaga over tee shirts ( I get enough of them in event goody bags) I have to tell you about Trash and Luxury’s line. I flipped over the screen printed vintage Vogue and Harper’s bazaar covers that are simply TOO DIVINE. Styles include a pocket dolman sleeved tee, a drop hem tank, scoop neck with pocket and more. The tees will run you around $60 but my personal favorite is the “Eiffel Tower Bazaar” skinny scoop tee on black ground at $50. While these may seem like a lot of money the quality of the fabrics not to mention the “look-at-me” factor makes this line worth the bucks.